I've always been intrigued by the Mexican holiday El Dia de los Muertos (the Day of the Dead.) Celebrated on November 1 and 2 to commemorate the Catholic holy days of All Saints Day and All Souls Day. Now celebrated actively throughout the world, the day has pagan roots, dating back to an Aztec festival dedicated to Mictecacihuatl, the goddess of the underworld. Every year a local art gallery, El Museo, celebrates the festival with an exhibition "Altars" featuring all kinds of locally done altars. When my good friend Kitty, who manages the gallery, asked if I was interested in being a part of the exhibit this year, I initially jumped at the chance without a clear idea of what I would do. I first had several different people in mind to memorialize in an altar, but when I thought of doing one for my good friend Edgar Allan Poe, a series of ideas came to me and I knew I had to do one for Edgar. My first experience doing an art project for a show since elementary school, I had an amazing amount of fun putting this together. The concept of a Day of the Dead altar is creating a display of objects commemorating a departed person's life, which in Mexico traditionally uses sugar skulls and other food objects. Unsure of how to incorporate a sugar skull, the first idea I had was to use some kind of alcohol or brandy for Edgar. The clear choice became the cognac the traditional Poe Toaster, until recently, left on Edgar's grave during the early morning night hours of his birthday, alongside a rose. Each object seemed to flow into the next-- when I thought of the cognac, I pictured the shot glasses standing on stacked bricks from "The Cask of Amontillado," standing in front of the altar. 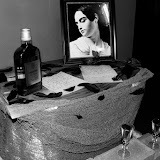 I initially wanted to use a photograph of Edgar, but when I thought of which to use, one that wouldn't be too conventional or standard, I had the small revelation that in order to commemorate the life and work of Edgar Allan Poe, the altar should be toward his wife, Virginia Eliza Clemm Poe. His devoted wife, Virginia stands over so much of Poe's body of work. His love for her, and her untimely death at the hands of tuberculosis, created much of his most famous work. Virginia is the maiden Annabel Lee, the long lost Lenore and, I believe the source of the intense fear of death and disease Poe explored in his writing throughout his life. And so, I needed a photograph of her. Which presented a problem, as there is no entirely confirmed photograph of Virgina; only paintings and sketches done after her death. I took the most famous painting, and used photo software to try and make the picture look like a Poe-era photograph. The framed piece became a center of my altar. Once put together, the base of the altar was covered by white cloth and frayed grey cloth sold in stores this time of year as "Halloween/creepy cloth." For the surface I used pieces of scrap wood dyed to appear older, for the floor boards from "The Tell-Tale Heart," which, through an opening, holds, in a bed of manuscript pages of Poe's work, a heart. The heart of the old man, and also, in my altar's case, the heart of Poe's work, his love for Virginia. Scattered about the altar are raven feathers, which appear throughout his work; the idea of the raven, that once lost, those we love are lost forever. The manuscript pages I made I took from "The Raven," "Annabel Lee," "Alone," "The Tell-Tale Heart" and "The Black Cat," and all from passages relevant to Virginia and Edgar's relationship. All in all, I absolutely loved doing this piece, "Quoth the Raven." Exploring what makes Edgar's work on life, love and death is central to the concept of the Day of the Dead, and to create something, an altar, to memorialize his and Virginia's contribution to the world was a great experience. I was proud to be a part of the exhibit that also held great pieces commemorating lost loved ones, pets, community members, well-known people and even the victims of World War II's holocaust. For anyone who may be in the Buffalo area, the exhibit will be at El Museo through November 25. I was there and it is wonderful, your friend Poe would be quite happy to be remembered on such a day and in such a personal way....good work ghost. I have always been a big fan of the Day of the Dead and have always marked All Souls Day in my own way. I have never heard of this custom and was intrigued. You did quite an amazing job with this altar. Well thought out and beautifully put together! Also - I had completely forgotten about Poe's story, "Cask of Amantillado"!! I remember reading it in 9th grade English class. I will have to revisit this work soon. Bingles: Why, thank you! I didn't know of the altar tradition before the gallery began doing the shows, too, and I have come to find that this is one of the most widespread customs associated with the Day of the Dead. The "Cask of Amontillado" is really one of Poe's lesser known major works. I've written about it quite a bit, and I do consider it one of his best suspenseful and technical pieces. Also, if you're curious about any of the other altars in the show, we were lucky enough to be featured in Artvoice (article here) and I was fortunate enough to have my altar pictured and discussed in the article.